As soon as Thanksgiving was over, I got to work on my Christmas decorating. I like a really festive, cozy look for the holidays, but don't want to go too over the top. And with our kitten, Gizmo, around this year we can't do too much anyway because he is into everything! My solution for crazy Gizmo was to put as much as possible out of his reach, and place ornaments in bowls instead of hanging them from a tree. Most of the decorations I like to put out this time of year were passed down to me from my grandma so it's very much a hand-me-down Christmas, which is just the way I like it. This is on top of the vintage cabinet in the bathroom where Gizmo can't reach! I got the cute elf ornament and vintage ornament beside it from my grandma, and I created a small display with my bottle brush trees and some epsom salt. I also put our little silver tree with red ornaments up here. It's our first tree we ever bought as a married couple and I love putting it out every year. I placed some red ornaments in an old colander handed down from my grandma, and changed out our glass mannequin head's summer hat for a winter sock cap (we call her Sheila haha). Sheila is kind of an eccentric part of our decor, but I love her! 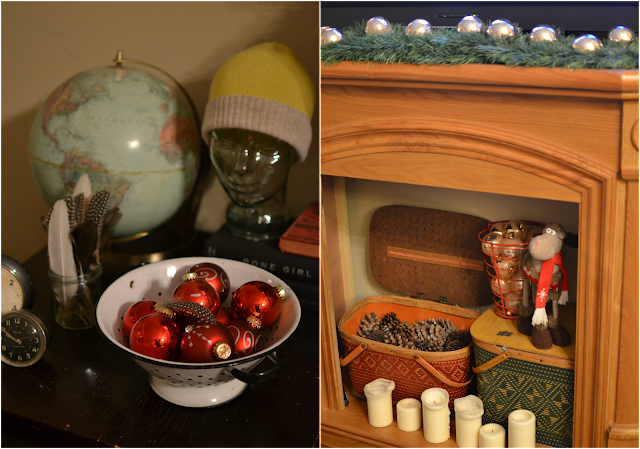 I also placed garland and ornaments on top of the mantle with some ornaments below in my egg bucket. Pinecones inside a picnic basket look so festive, and my cute reindeer from David's grandma completes the scene. This mantle is where our electric fireplace goes, but we took it out when we were installing the new floors and haven't replaced it yet. But I kind of like it empty! When I was visiting my grandma yesterday we took a trip up to her attic. She has so much stuff she's collected over the years and is trying to give it away, so I always leave her house with a few things to bring home. She gave me this gorgeous quilt that she made herself many years ago when my grandpa had to work late nights. She worked on quilts to give her something to do and keep herself busy. I just love pieces with history behind them - so special! I also brought home some cute vintage ornaments that I strung up on the headboard as a garland. Our "headboard" is actually just two old shutters that David's grandpa was throwing out that we attached horizontally to the wall behind the bed! My grandma also gave me this ceramic tree a few years back and I love putting it out each Christmas. And last year, she gave us a silver tree with a color wheel! We put that up this year and so far Gizmo hasn't messed with it too much, so I think we'll be able to keep it up. I've caught him just sitting and watching the colors change as the wheel turns. I think he's mesmerized by it! Have you begun your holiday decorating yet? This week in the Homemade Living series, I am joined by Mary and Jackie in posting about how we incorporate homemade items into our lives. Next week Daisy, Staci, and Sue will be up. If you have some free time, please check out the other posts in this weekly series! Your decorations look so beautiful! I have some of my grandmother's ornaments too. I haven't put them up in a few years because of the boys (they are breakable). Treasures! I love all the vintage decorations, Tammy. They will remain your most treasured ones. Audrey is being good so far this year, too. We have the tree up and decorated and she just sits under it and looks up. A little paw bats at something once in awhile but so far so good. I like your decorations! And so nice that your grandmother gave you one of her quilts. That's I gift to treasure, for sure. I haven't even begun to decorate for Christmas. I love your vintage decorations! And ones handed down from your family are even more special- looks great! What is your silver tree with a color wheel? My Mom has given us so much of the Christmas decorations we used when I was a kid. She also had a ceramic tree like yours, but gave it to my sister -- so I made one for myself. re: Your Grandmother's quilt!! How wonderfully priceless!! The ones I got from my Grandmother (1900-1974) was made from dresses and overalls and clothes they had worn out. My Mom will look at her Mother's quilt that I have and point to different pieces of fabric and say- that was my dress in 4th grade or that was my Dad's overalls or that was my sister's shirt in high school. Also, you may want to have your Grandma sign her name in perm. marker on the back corner and write the year if she remembers it -- or about the time she made it. Quilts from generations past usually are family story tellers! I think holiday decorations are more special when they are passed down. They have special memories attached to them and it's so nice to be able to have that this time of year. I love the hand-me-downs ..... how I wish I had just one of the Christmas ornaments from my mother! My grandmother had one of those ceramic trees too—it had the coloured glass 'lights' that lit up from the light inside the hollow tree. I completely forgot that some of them had those sort of florets on them like some on yours—I loved those florets things for some reason. I used to like to take them out an change their locations on tree. It was on a little table with the telephone on it next to a window. I think the kitty will eat any tinsel you may have. But I expect you've already seen that. Those plastic 'icicles' draped on the tree used to be the favourite food for cats back in the day. Cats believe the recommended daily allowance is at least 20 'icicles' every 24 hours to be taken with a felt catnip mouse. *These statements have not be evaluated by the FDA (the Feline Drug Administration) who is currently studying the nutritional value of Christmas ornaments. Beautiful! Love the vintage decorating - last year I scored one of those ceramic trees and was SO excited! i love it and love that retro feel! My grandmother had a silver tree with a color wheel! Haven't seen one of those since. Brings back memories :) Thanks for stopping by earlier and your nice comment. Nothing wrong with a hand me down Christmas it just makes it even more beautiful because there's a story behind everything. I really love that quilt. Your grandma has some really great quilt making skills. Hope you're having a great week! And I want that quilt. I love your new quilt. What a treasure! Your decorations are so sweet and cozy, and it's so neat that they all have stories behind them. Cats can certainly get into some trouble at Christmas. When we were putting our tree up, our cat June stole about six feet of garland right off the tree. She ran away with it and started wrestling it in the hall. She was having the best time. You have some real treasure from your grandmother! BOy....did that elf ornament being me back to my childhood....not the elf part but the angel hair wrapped ornament part. love the quilt...what a treasure. I see there is a beautiful quilt on the bed! Love it, Tammy! Hand-me-downs are the best.. tradition & memories hand in hand! 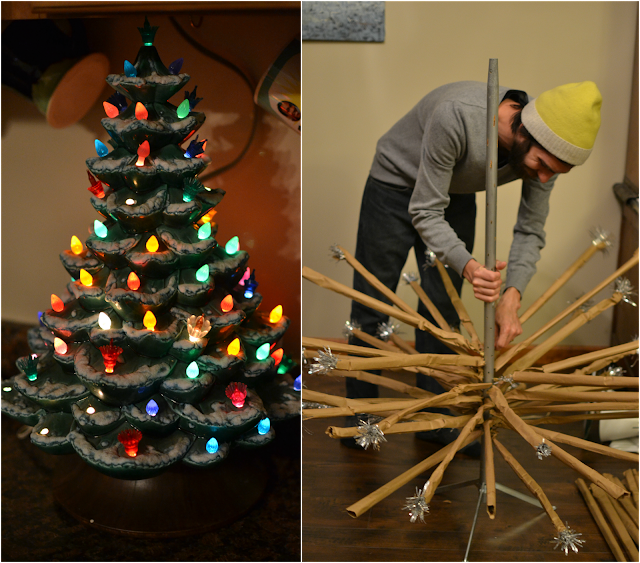 We begin our holiday decorating this Saturday. I'm stubborn about taking one holiday at a time, and I like to spend of all of Thanksgiving weekend on that holiday.. But this year was a conundrum because I also usually start decorating the first weekend of December, and this year the two overlapped! Mother Nature has done quite a job for us decorating over the past couple of days.. it's a winter wonderland, we're in the middle of about a 2 ft. snow accumulation so far!! PS: That quilt - What a treasure!! That quilt is gorgeous! You are so blessed to have your grandma share her treasures with you. Take whatever she wants to give you! The old ornaments are just beautiful. Enjoy. oh my gosh, i LOVE all that vintage christmas stuff from grammy! lucky you!! and i also am in love with your shutter headboard...and is david wearing sheila's cap? :) your decorating looks super! That is one Beautiful Quilt must have taken her a long time, with great results..Love your decorations , I have put some lights up across the l drawing room arch...they are roses. What a beautiful quilt! My grandmother passed away last month and when we were cleaning out her house we found multiple quilts that are well over 100 years old. I was able to get one of them, but unfortunately, I don't know who in my family made it. I do know it was not my Grandmother's work (as she didn't make quilts) but both her mother and grandmother were very skilled at it. It looks a lot like yours! You received a lot of beautiful things from your Grandma! I bet your house is beautiful this time of year!!! Makes me want to come over for some tea! Sheila cracks me up - what a great idea! love all the photos and memories that go with them and such a cute idea to string some ornaments on the headboard! My grandmother has that ceramic Christmas tree too!! How very special to have such wonderful pieces that bring back memories. And that quilt! It's beautiful. Ohh I really like your homemade headboard, so nice! Love that you have so many of your grannies goodies too. What treasures. I have started to decorate but think I need to do a bit more... Perhaps I cut back a little to much? Have a great day! I love all your decorating and the quilt is beautiful! Grandma's quilt is beautiful! How wonderful that you get to take pieces of her home with you at every visit! Hand me down decorations are the way to go. At least that way it means something! I remember one year my mom and dad's cat was sitting under the tree with cotton stuck between her claws. She had this look of complete nonchalance but not three feet away from her was a beardless Santa. She seemed to be saying to us, "I didn't do it." Oh, my! There's so much to love about this post...the picnic baskets, bottle brush trees, hand-me-down ornaments, your grandma's quilt and CHRISTMAS. :-) Lovely. Tammy, your decorations and home look lovely. I love the quilt. And what a great idea for the bottlebrush trees and the epson salt for snow. My mother used to have a ceramic tree too, it was easy and looked pretty with the lights lit. Lovely post! Have a great evening and weekend ahead! LOVE LOVE LOVE your new header!!! Love this!!! My mom and grandma both have the exact same ceramic trees that they made! Love it. Your headboard is awesome, original, and clever. Vintage decorating... two thumbs up! Your vintage ornaments are precious. I like the elf! These are such great ideas :) My favorite has to be the Christmas ornaments strung over the bed frame! Passei para uma visita e para ver sua decoração de Nata. Amo tudo que envolve o Natal. i so love your christmas decorations! great decorating ideas too. your home looks lovely and cozy my friend! your grandma's ceramic tree is precious! and beautiful!! Your Christmas decorations look so pretty. So warm and cozy.. My Mom has that same ceramic Christmas tree. She has had it for Years. I just love it. Such pretty decorations, love the vintage and that quilt your grandmother made is gorgeous! Those are the best kind if decorations to have, they may be hand me downs, but they are treasures too. I love the quilt, the silver tree, and the headboard is awesome! The decorations are beautiful, and very special, but for sure the quilt tops the list, it's AMAZING! !